Hyundai introduced its original fuel cell technology on the Tucson crossover in 2013. 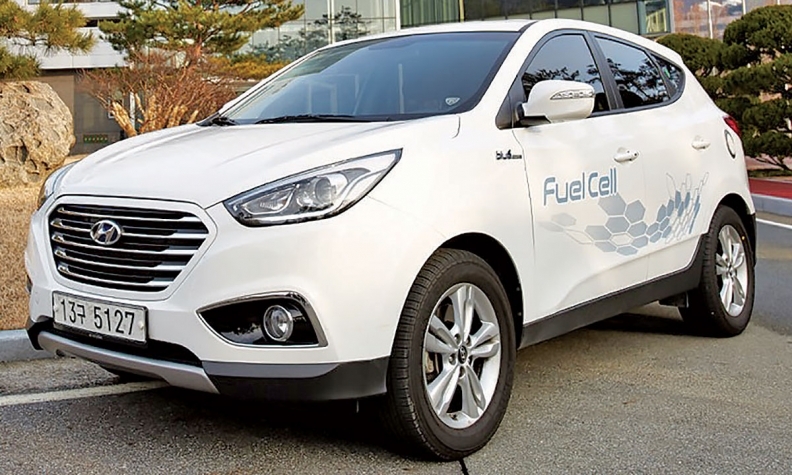 HWASEONG, South Korea -- Hyundai Motor Co. will debut its next-generation hydrogen fuel cell system in 2018, just in time to showcase the technology at the Winter Olympics in South Korea. The system will appear in a "totally new" vehicle that is "somewhere between a CUV and SUV," said Ahn Byung-ki, Hyundai Motor Group director of eco-vehicle development. Hyundai introduced its original fuel cell technology on the Tucson crossover in 2013. The company has produced fewer than 1,000 of the vehicles to date, Ahn said. The new fuel cell will be smaller and require less platinum in the catalyst, he said. The battery will be bigger, while the electric motor will be smaller and lighter but have higher output. He said the 2018 Winter Games in Pyeongchang will be a stage for Hyundai to market the next-generation fuel cell vehicle. Hyundai is also preparing a fuel cell bus to possibly debut at the games. "We're going to make a big event with the Pyeongchang Winter Olympics," Ahn said this month in an interview at the carmaker's Namyang r&d center here south of Seoul. "It's a big event. That's always a good opportunity for PR." Yang Woong-chul, Hyundai vice chairman and r&d chief, said the automaker is bucking the industry trend by developing its fuel cell technology internally. Yang downplayed the benefits of partnering, as other automakers are doing. More alliances end in failure than success, he said, and it is hard to keep both sides equally motivated and committed when sharing work. The Olympics plan is part of the Hyundai group's bold blitz to introduce 28 new eco-vehicles by 2020 across the Hyundai, Genesis and Kia brands. The rollout will cover 10 traditional hybrids, eight plug-in hybrids, eight electric cars and two fuel cell vehicles.